Helping you get the most from your Bird Guardian. Q. How do I attach the Bird Guardian to my birdhouse? A. 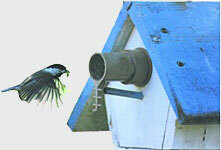 The Bird Guardian fits birdhouse openings from 1" through 1-1/2." The Bird Guardian is attached with three supplied wood screws. The typical instalation time is about 5 minutes. If the existing nest box has a wood or metal pipe entrance cover, simply unscrew or gently pry off and attach the Bird Guardian for predator protection. The Bird Guardian keeps nestlings and adult birds out of harms reach. Q. Will I get birds in all of my houses if I use Bird Guardians? A. There is no guarantee you will get birds in every house with or without a Bird Guardian. Our tests show chickadees, house wrens, tree swallows and other backyard birds actually seem to prefer the Bird Guardian protected boxes, leading us to wonder just how smart the little guys are! 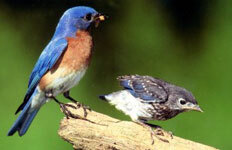 SPECIAL NOTE FOR BLUEBIRDS--For those individuals who are trying to attract bluebirds we recommend not to apply the guard until after the birds have developed an attachment to the nesting box. This would be after nest building and egg laying, since we found that most of the bluebirds preferred boxes w/o the guards, but accepted them when applied at this time. We have had bluebirds accept the guards upon inspection of their nest box but not as often as when the guards are applied after nesting begins. The goal is to protect these birds and sometimes with the bluebird it will take a little more effort to protect them from predators but the extra time is well worth the results of watching a successful fledging of these beautiful young birds! That's the goal...to protect them whether they know it or not. Q. Which birds will benefit from the use of the Bird Guardian? Q. Should I remove the Bird Guardian in the fall? A. No. Keep Bird Guardians on all of your houses year-round. Many species of birds cozy up together in birdhouses in the winter for mutual warmth. 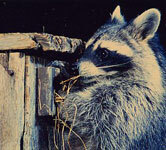 Small squares of wood that are attached to the birdhouse don't provide protection for the nest. They will be protected from raccoons and other predators.